I LOVE homemade cinnamon rolls. I don’t indulge often, but do enjoy them as a special treat. 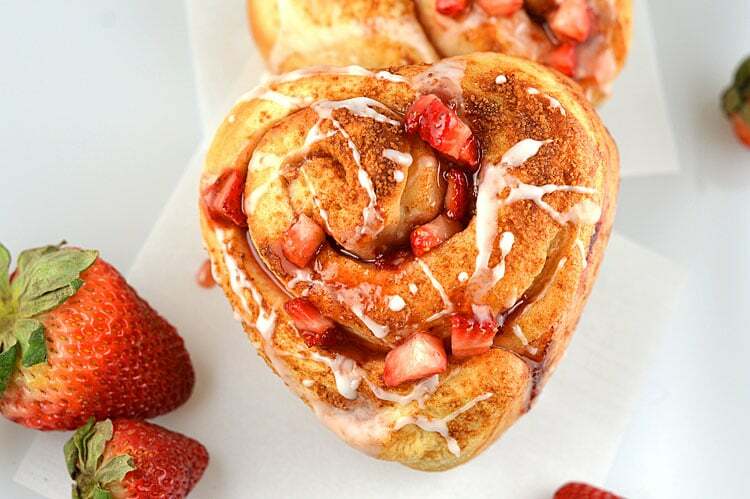 I wanted to come up with a twist on the traditional recipe for Valentine’s Day and this Strawberry Cinnamon Roll with Lemon Glaze Recipe is sure to make your sweetheart fall in love with you all over again! To begin, I melted vegan margarine with almond milk (both of which I always keep on hand) in a small saucepan over low heat until the margarine is completely melted. Cool to a very lukewarm temperature. If this mixture is too hot, the yeast will not activate. 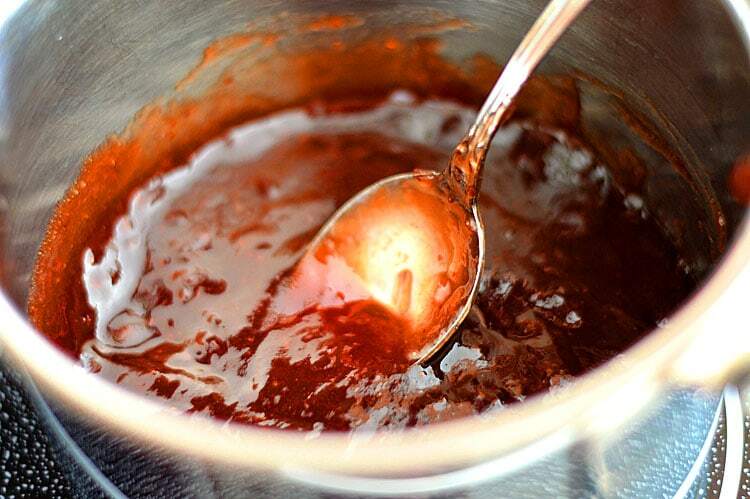 Transfer this mixture to the bowl of an electric mixer and add the yeast. Add 1 Tbl of sugar and 1/4 tsp of salt. Next, add the flour 1/2 C at a time, mixing each addition just until combined. Do not overwork. The dough should form a smooth ball. Transfer to a bowl with a bit of oil and coat the entire suface of the dough before covering with a kitchen towel. Set in a warm, but not hot, place and allow to rise for about an hour. 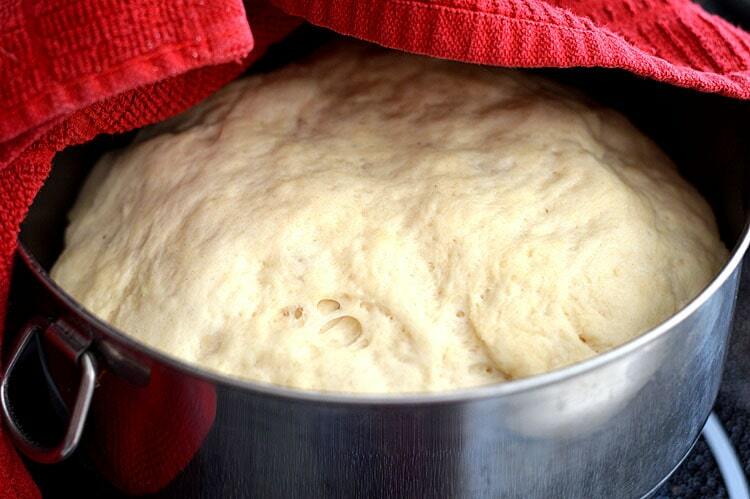 After one hour, your dough should look like this. If your kitchen is very cool, one trick you can try is to preheat the oven and set this bowl on the stovetop. That indirect heat really helps the dough to rise. Another item I picked up were strawberry preserves. I warmed it slightly just to aid in spreading it over the dough. Meanwhile, in a small bowl, I added the diced strawberries, 1 Tbl of sugar and 1 Tbl of cornstarch. If the strawberries are very juicy, you may want to add a bit more cornstarch. Allow this to sit for a few minutes. We only want to use the strawberries, not any liquid that comes as a result of this mixture. On a lightly floured surface, roll out the dough to about 1/4″ thick. I did mine in a rectangle, which was fine, but in retrospect I might have done a square for thicker rolls. 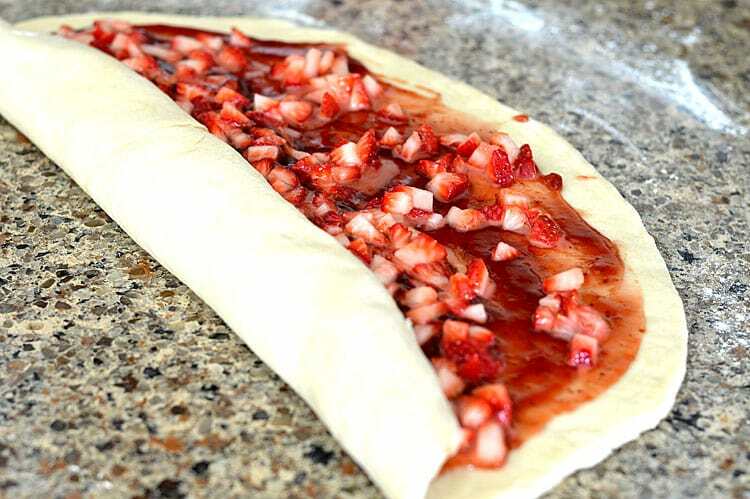 With an offset spatula, evenly spread the strawberry preserves onto the dough leaving a 1″ border all around. I found that I could have added fewer diced strawberries. As you roll, you will lose a few in the process. I reserved the remainder for serving. After rolling the dough, cut into 2-1/2″ to 3″ rounds. Place cut side up in your pans. 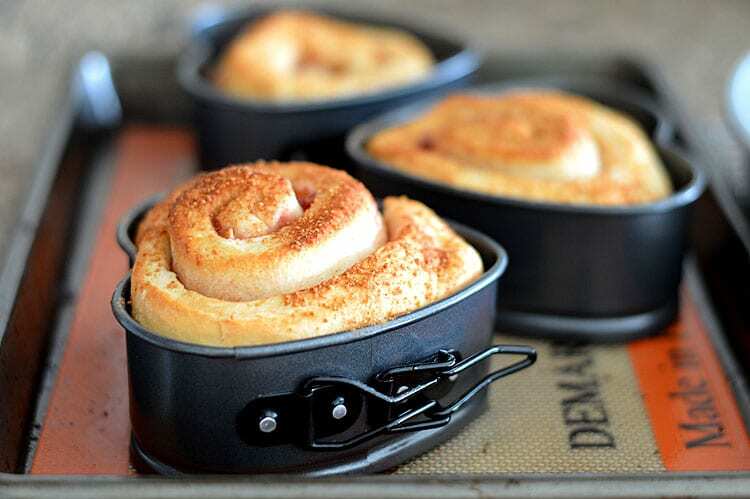 If you don’t have these cute individual pans, just prepare as you normally would and place all in an 8″ round cake pan. Allow to rise. This should take about 20 minutes. I do this while preheating the oven. For the heart pans, I did initially press them slightly to help them rise into the correct shape. As you can see, they rose beautifully! Oh, and that sprinkling of cinnamon sugar you see on the top is also from Smart & Final. I found it purely by accident. It’s actually from their Ambiance line and called Cinnamon Hot Beverage Sprinkle. I loved how large the sugar crystals were and it worked perfectly as a topping to these sweet rolls. I brushed first with a bit of melted vegan margarine and gave a generous sprinkle to each roll prior to baking. The last part of the process is to bake the rolls at 350 degrees for about 25-30 minutes. While baking, a super quick glaze is created by combining powdered sugar, vanilla extract and a bit of lemon juice. You can eyeball this and make as thin or as thick as you like. 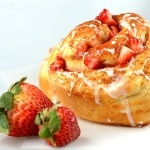 We topped the baked Strawberry Cinnamon Rolls with the glaze and some of the reserved diced strawberries. Serve to your loved one this Valentine’s Day garnished with whole strawberries and his or her favorite hot beverage. They were absolutely delicious! To learn more about Smart & Final, or to find a location near you, visit them at: Smart & Final and follow them on Facebook and Twitter! In a large sauce pan, heat the almond (or coconut) milk and 3 Tbl of vegan margarine until warm and completely melted. Do this on the lowest temperature possible. Remove from heat and let cool. It should be lukewarm, if it is too hot it may deactivate the yeast. Transfer to the bowl of an electric mixer and add the yeast. Then add 1 Tbsp sugar and the salt and stir to combine. Next add in flour 1/2 cup at a time, incorporating each before proceeding. The dough will be sticky. Continue to add flour until dough becomes smooth and forms a ball. You can also finish this process on a lightly floured surface by hand. Place the dough into a lightly oiled bowl, coating the entire surface of the dough with the oil and cover with a lint-free towel. Allow to rest in a warm place to rise until doubled in size. This should take about an hour or so. 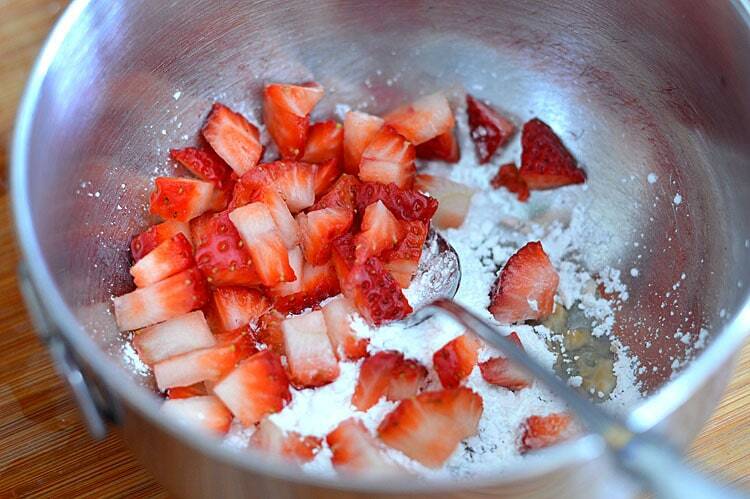 Toss the diced strawberries with 1 Tbl of sugar and 1 Tbl of cornstarch. Roll out the dough into a square shape on a lightly floured surface. Warm the preserves just enough to make it spreadable. Using an offset spatula spread the preserves in an even layer onto the dough, leaving a 1” border all around. Sprinkle the diced strawberries onto the preserves taking care not to add any of the residual liquid. I used a slotted spoon and drained as I went. 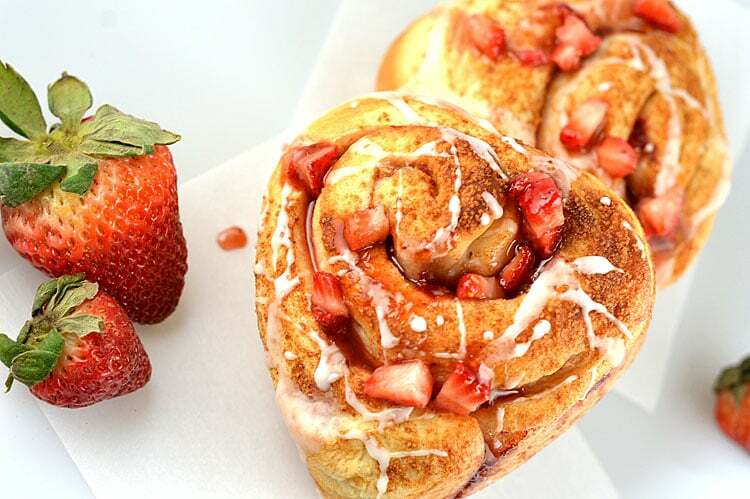 We’ll reserve any remaining strawberries and juices for topping later. Starting at one end, tightly roll up the dough and place seam side down onto a lined baking sheet. Then with a serrated knife, cut the dough into 2-1/2”-3" rounds. Very lightly brush the pan with vegan margarine or spray with cooking spray. Place round cut side up into desired baking pans and cover with a towel. Set on top of the oven to let rise again for about 20 minutes while you preheat to 350 degrees. Once risen, brush the tops with melted vegan margarine and sprinkle with the cinnamon topping. Bake for 25-30 minutes or until slightly golden brown and cooked through. Thicker rolls may take a bit longer. Prepare the lemon glaze by combining confectioner’s sugar, lemon juice and vanilla. 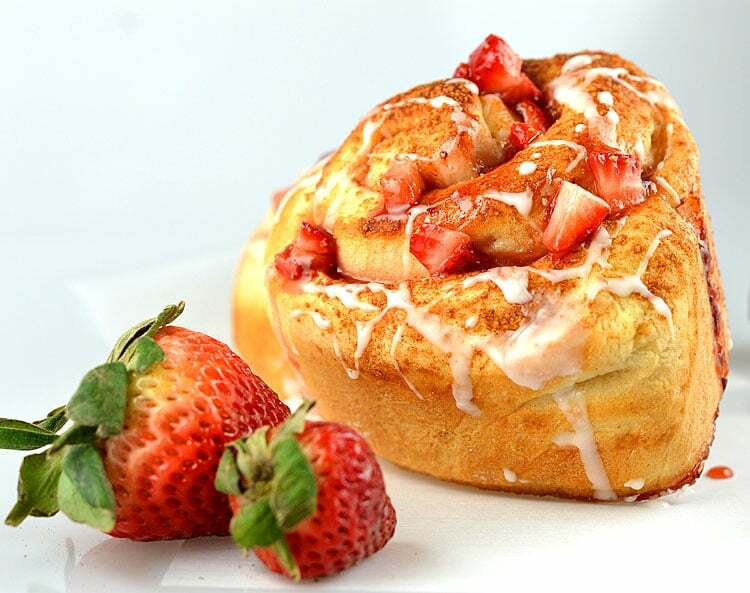 Serve the rolls warm with a drizzle of glaze, the reserved fresh strawberries and their juices. Garnish with whole strawberries and fresh mint. I have their mini round pans and this makes me want to impulse buy the heart shaped pans! I have the round pans too LOL I know I shouldn’t be caught up in the novelty, but I cannot seem to resist buying things like this! not Strawberry ones! I need those heart pans too! Very cute!